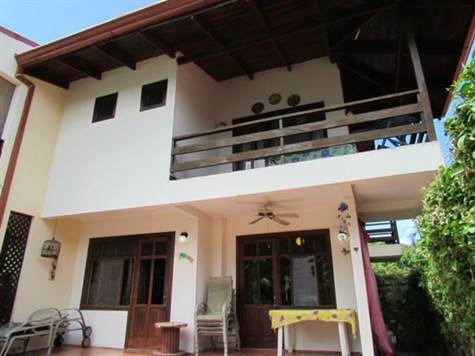 2 Story townhouse in small gated community with pool located only 2 minutes walk to the main street in downtown Jaco and 5 to the beach. Do not bother renting a car, if you need a longer ride cabs are plentiful and close at hand. This very conveniently located apartment has two bedrooms upstairs and one downstairs, with corresponding bathrooms. The balcony in the main bedroom has views of the pool area and the green-forested mountains as backdrop. The living room is ample and it also has separate dinning room. The kitchen is modern and has a lot of wooden cabinets. There is a covered garage for one car and there is free street parking around the cul de sac. The home also has guest bathroom and laundry area. Outdoors on the terrace facing the pool.. The community has 24-7 security.